I have been doing CrossFit since 2014; I have been coaching since 2016 and have competed in two CrossFit competitions in my career so far. In July of 2016, I competed in the Can West Games held in Coquitlam, BC. On the first day of competition, I experienced significant ripping of my palms, with 4 events remaining in the competition. This was my first exposure to Fit Balm’s Hand Repair Balm, brought to the rescue by Fit Balms founder Morgan Rozon. Without the calming effects of the essential oils and healing effects of vitamin E oil, I know the struggle with my hands for the remainder of the weekend would have been increasingly more difficult. Post competition, I applied the balm to my hands every night before bed, and within days I was able to hang off a bar again and continue training. 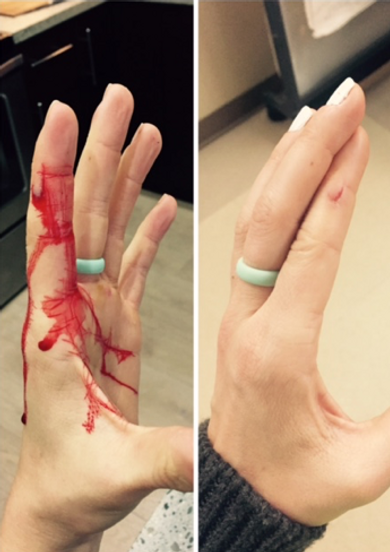 I also owe Fit Balm for…..This past week I was doing my weekly meal prep, when I had an unfortunate slip of my kitchen knife, resulting in a cut to my left ring finger. Since I now have a bedtime ritual to apply my Hand Repair Balm to my CrossFit injuries, I thought I may as well add my kitchen knife mishap into the mix to help with the healing process. I was pleasantly surprised by the healing progress after 3 days! I without a doubt owe this healing time to Fit Balm’s Hand Repair Balm! Thank you! !